Andrey Koptyug och Mikhail Tkachev arbetar vid Arcammaskinen. Sports Tech Research Centre har haft långväga besök av Mikhail Tkachev, som fokuserar på material för implantat i sina studier och läser vid ett av våra partneruniversitet, National Research Tomsk Polytechnic University i Tomsk, Ryssland. Mikhail har som gästforskare deltagit i gemensamma försök att ta fram prover på implantat och studerat ytbeläggningens funktioner på dessa komplexa strukturer. Det är Mikhails första vistelse utomlands och här berättar han mer om sig själv, sina studier och forskningen. I am a student of National Research Tomsk Polytechnic University (Russia, Siberia, Tomsk), Department of Experimental Physics. My specialty is beam and plasma technology. What kind of research are you involved with? I’m currently a member of research group which also includes Evgenij Melnikov, Maria Surmeneva, Ekaterina Chudinova and Roman Surmenev. Our research interests are related to study and production of materials for implantology. 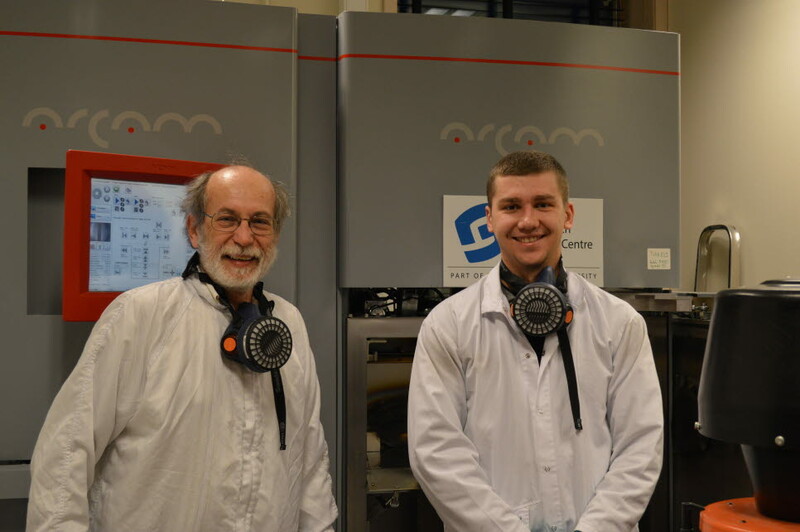 Together with Additive Manufacturing group at Mid Sweden University we develop materials and structures with the parameters close to the ones of human bones, using electron beam melting technology. Additive Manufacturing technologies are known to allow the production of parts with an extreme degree of complexity, enabling design and functional part optimization. Additive manufacturing for example allows components combining solid and 3D-lattice sections manufactured in a single process. Using this approach modern medicine can simulate the shape and functioning of implants in the computer and perform 'virtual surgery', and manufacture preoperative models of damaged and broken bones and individually optimized implants and surgical instruments. What is next and have you picked up any new knowledge? The next step of the study is investigating the optimal shape and size of the mesh structures providing best integration into the human body, which was the purpose of this internship. At Sports Tech Research Centre (Mid Sweden University, Östersund), we have fabricated lattice structures with different elementary cells for further testing, which will include mechanical and biophysical studies. During my stay at Mid Sweden I have learned the basics of operation and of everyday maintenance of ARCAM electron beam melting machine. Moreover, I want to thank my supervisor Dr. Andrey Koptyug and all staff of Sports Tech Research Centre for their cooperation and assistance in research, as well as for the organization of training and warm welcome.